One of the best UAD plugins yet, a must-hear for any self-respecting electronic music producer, and a no-brainer upgrade for owners of the original. The best virtual Moog filter ever. V9.1 of Universal Audio’s UAD Software brings with it beefed-up new versions of two existing plugins: the Moog Multimode Filter and SSL 4000 E Channel Strip. With today’s Apollo and UAD 2 systems boasting so much more power than the UAD cards of yesteryear, it makes sense for the company to rebuild its most iconic emulations to take advantage of the increase in DSP grunt available. These two, then, are the latest in a line of remakes that includes the superb 1176 Classic Limiter Collection and Teletronix LA-2A Classic Leveler Collection. The original Moog Multimode Filter dates back to 2009, and the headline act in the new Collection is the Moog Multimode Filter XL, which “borrows from various incarnations of Moog designs” (ie, the envelope from the Ladder 500 and the LFOs from the Sonic Six), but most liberally takes cues from the Sub 37 synth. Also included are the original Moog Multimode Filter and the low-DSP SE version, primarily for compatibility with old projects. All three were developed in conjunction with Moog Music, it’s worth noting. MMF XL represents a major functional step up from its predecessor, with significantly more going on in the knobs department. Equally if not more importantly, though, the core algorithms have been improved, resulting in smoother cutoff and resonance sweeps (particularly at high frequencies), spikier overdrive, and sharper self-oscillation. Auditioning new against old, the differences are immediately clear - which isn’t necessarily to say that the earlier version is categorically ‘worse’. Contemporary sound design being what it is, it will still have its uses. In terms of DSP usage, running on an Apollo Twin Duo Mk1, MMF XL uses 21% DSP and 19% Program Memory, while MMF draws 16% DSP and 11% PGM, and MMF SE drops to 10% and 9%. XL Junkie MMF looks comically tiny on today’s high-resolution displays, so XL’s interface has been scaled up considerably, aiding greatly in terms of legibility and mouse control. Moog Multimode Filter XL’s awesome four-track step sequencer is revealed with a click of the Edit button. Synced to host tempo or manually set from 10-300bpm, it enables programmed modulation of any four parameters - selected using the big menu buttons on the left - from Drive, Cutoff and Resonance to Filter Mode and Slope, Envelope Amount, LFO Waveform, and even the LFO Hi and Reset buttons. Modulation of continuous knobs is bipolar, while selecting a stepped knob or button calls up a graph-style display on that track for switched value entry. The number of steps (up to 16) is set independently for each track (polyrhythms are go! ); the Step Length ranges from 1/64 to 1/1; six playback Directions are available (Forward, Reverse, two Ping Pongs and two Randoms); and shuffle can be applied via the Swing knob. The Amount and Glide controls govern the modulation depth and smoothness of step-to-step transitions, the latter moving from sharp jumps fully anticlockwise to smooth slides clockwise - it’s only a shame they’re not listed as sequencer targets themselves! A monumentally inspiring addition, the step sequencer really brings MMF XL to life, particularly when deployed in partnership with the LFOs. Of course, it helps that it looks absolutely gorgeous, too - enticingly photorealistic. Operational improvements to the filter itself comprise the addition of a notch option to the existing low-pass, high-pass and band-pass modes, and 1-pole (for low- and high-pass only) and 3-pole options to the established 2- and 4-pole selections. Beyond that, the Step/Track switch has become the Smooth button (for switching between analogue-style liquidity and automation-friendly stepping), and the Voyager-style stereo Spacing control becomes even more useful than ever when modulated by the step sequencer (see boxout). If MMF XL’s improved filter hasn’t already got MMF users reaching for their PayPal passwords, the modulation setup surely will. The jewel in the crown is the four-track step sequencer, discussed in the boxout, but the supercharged new envelope follower and dual LFOs are no slouches either. The original MMF envelope was a single-knob (Amount) affair based on the MF-101 Moogerfooger, modulating the filter cutoff with a choice of Smooth or Fast response modes. XL’s Envelope section not only offers a choice of target parameters (Cutoff, Resonance, LFO Rate, LFO Amount, or any combination thereof), but also features Attack and Release controls for detailed response-shaping, and a Sensitivity knob for tweaking the envelope triggering threshold. The LFO section is similarly impressive. Where once sat a single low frequency oscillator with phase offset, we now have two of them, working fully independently, their outputs mixed using the Balance knob. LFOs A and B are identical, running synced from 1/64 to 16/1, or unsynced from 0.01-50Hz in regular mode and 0.5-1000Hz in Hi mode, with Tap Tempo buttons on hand for manual timing. The upper range of Hi mode opens up the potential for all kinds of edgy pseudo-FM-style effects that can get particularly wild when the filter is pushed into self-oscillation. The six original LFO waveforms have been joined by a seventh, Slewed Random (smoothed stepping); and the Width knob pushes the two LFOs away from the centre in opposite directions, until at +10 LFO A only modulates the left filter channel and LFO B only modulates right, or vice versa at -10. Further stereo manipulation can be performed with the Balance knob in the Output section - a straightforward L/R balancing and (in Mono mode) pan control - and the aforementioned Spacing parameter. Moog Multimode Filter has been a staple in our DAW since the day it dropped, and Moog Multimode Filter XL supersedes it in every way. It sounds even phatter, thicker, squelchier, creamier, screamier and dirtier (we’ve not really mentioned the distortion circuit - it’s splendidly filthy), and the comprehensive onboard modulation tools make it infinitely more rhythmic and thus creative. 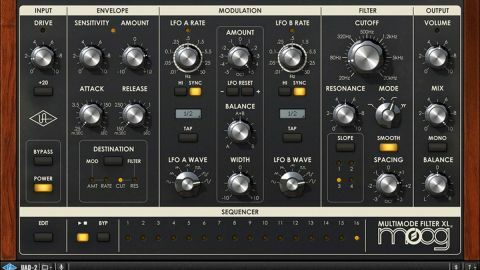 If that authentic Moog filter sound is something you, as a UAD-2/Apollo owner, have any need for at all, this is unarguably the gold standard.